Earlier this month a group of “youths” attacked a Hare Krishna temple in Copenhagen, doing damage and trying to attack the temple’s devotees with baseball bats. Strangely enough, the story never made it into the Danish MSM. 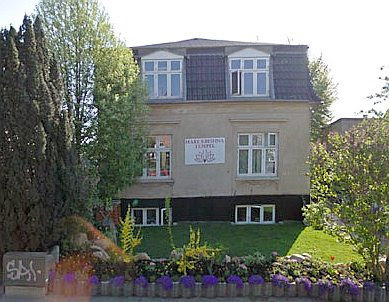 by Nicolai Sennels: The Hare Krishna temple in Vanløse (Copenhagen) was attacked by young Muslims on December 6. It started when young Muslim terrorists threw stones, and later, armed with clubs, tried to break into the temple. The award-winning blog Uriasposten received an internal email from the temple, describing the incident in detail. Sappho called the temple, which confirmed the attack. The violence happens as a result of the many calls for attacks — and attacks now happening — against non-Islamic groups in Islamic countries. The temple is now urging its supporters not to wear the distinctive orange robes near the temple to avoid physical attacks. The reason for the attack in Copenhagen may have been that a Muslim motorist was annoyed that a Hare Krishna follower criticized his awkward parking. “On Dec. 6 pm. 20.45 The temple in Copenhagen was attacked by a group of young people who obviously had a Muslim background. The first stone was thrown at the front of the temple, smashing the window of mathaji asrama. “The temple president summoned the police immediately. A single police officer arrived and took note of the damage. When unknown assailants tried to set fire to a mosque in Brønshøj, it was in almost all media. The Muslim attack on Hare Krishna has still not been mentioned anywhere in the mainstream media.